And while this view is a bit exaggerated, it’s understandable. Increased demand for expedited delivery, refrigerated transportation and major developments in logistics technology—coupled with a driver shortage—have kept transportation and logistics companies on their toes. One of the biggest shake ups in this whole equation has been the Electronic Logging Device (ELD) Mandate—which, in tandem with Hours Of Service (HOS) regulations, aims to create safer roads, more accurately compensated drivers, and better data. It’s important for any shipper, potential driver, and carrier to understand the nuances of ELD and HOS, so we’re going to do a deep-dive into the two regulations and explore how they interact with each other. After reading this article, you’ll be equipped with everything there is to know on Hours of Service and Electronic Logging Devices. Ready? 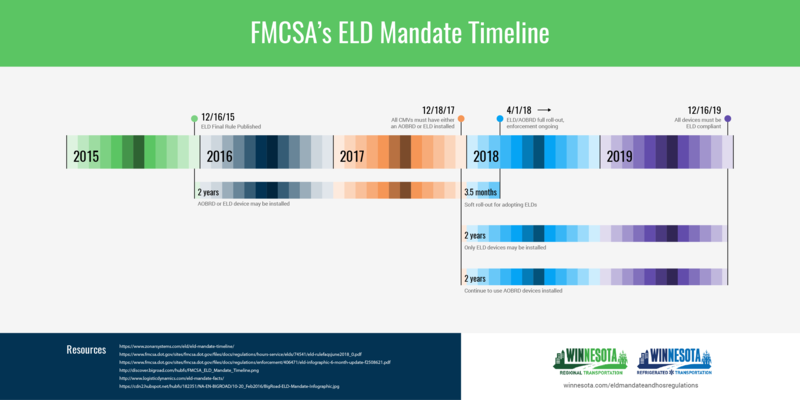 Before jumping into the actual nuances of the mandate, it’s helpful to understand the background, and the motivations for making ELD a reality. In December of 2015, the Federal Motor Carrier Safety Administration (FMCSA) released its final electronic logging device rule, which is also known as the ELD Mandate. In 2012, the United States Congress enacted the “Moving Ahead for Progress in the 21st Century” bill, which included a provision that required the FMCSA to come up with a way to mandate the use of ELDs in commercial vehicles. This portion of the bill was aimed at eliminating the use of paper logbooks and instead using more reliable technology to log hours and other important data about driver performance and activity. Automatic On-Board Recording Devices (AOBRDs) are still used by some drivers to reduce paperwork. AOBRDs meet some of the standards of the ELD Mandate, such as the requirement to record a driver’s duty status, changes in status, and the amount of time a driver has operated a vehicle. The On-Board Recording Devices (EOBR) regulation was another precursor to ELD, but had to be eliminated due to compliance issues with Hours of Service regulations. But ELD regulations haven’t yet been enforced in their final form. 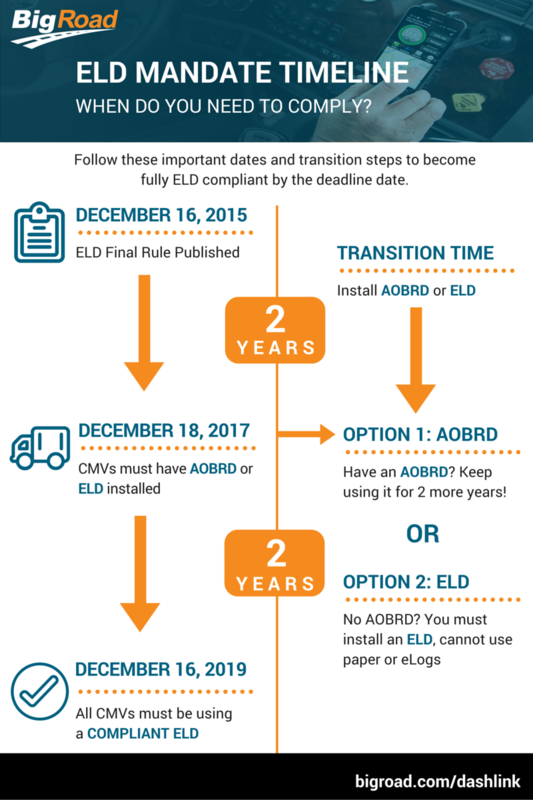 In fact, on December 18th, 2019, early ELDs—including AOBRDs—will no longer be compliant if installed before December 18th, 2017. Because newer ELDs are more sophisticated, going far beyond the basic function of tracking a driver’s Record of Duty Status (RODS), and can track vehicle inspection reports as well as driver behavior. Synchronization with the truck’s engine can provide reporting on whether a driver has a tendency to drive in a way that is unsafe or damaging to a vehicle. Factors such as speeding, hard braking and idling are all trackable. Some ELD systems can also integrate route and map solutions, helping drivers get to their destination on time while avoiding traffic, construction, and other obstacles. The most obvious potential benefit of using ELDs is that it allows both drivers and transportation companies to be fully compliant with the most recent regulations around Hours of Service. Drivers save time and efficiency because paperwork is reduced when they have access to Electronic Logging Devices. Fleet managers always know what’s going on: Loads can be planned more efficiency and delivery times can be more easily estimated. Fleet managers also have a more accurate and timely picture of the HOS compliance of their drivers. Because of this. They can quickly address compliance issues. No need to carry around a paper log. At the end of the day, once the learning curve is surpassed, it’s much easier for drivers. Clearly, ELDs have the potential to make life easier for drivers, fleet managers, and human resource departments at transportation companies. If the Mandate is rolled out effectively, it could also make processes more efficient, eliminating unnecessary paperwork and decreasing margins for error. Now that we know the background and benefits of ELDs, what does the actual policy entail? Simply put, the ELD mandate requires commercial motor vehicle drivers to record their hours of service using ELDs. An ELD can be defined as any DOT-certified electronic hardware that connects to a commercial vehicle’s engine to record driving hours. The device types can vary from smartphones to tablets and laptops. The key is that the process is completely paperless. The mandate also covers specifications for manufacturers of ELDs, methodology that DOT officers must use when checking ELDs, and how ELD data must be stored. If drivers are found to be noncompliant, the DOT reserves the right to levy fines, but the mandate does not specify that a first offense could result in a license suspension or a requirement that the vehicle in question stay off the road. Drivers need to know how to properly use the devices, being able to annotate, edit and certify RODS, and collect all necessary supporting documents. The FMCSA has a resource on their website to help with this. The ELD mandate was not a “snap-of-the-fingers” legislation. It unfolded (actually, it’s still unfolding) in multiple phases, in order to facilitate gradual adoption by drivers and transportation companies. 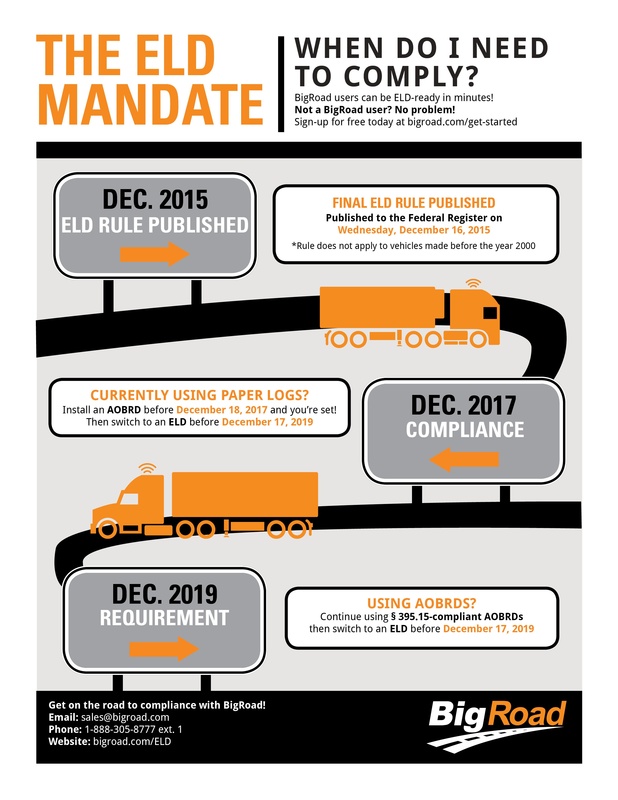 On December 16th, 2015, the final ELD rule (known as the ELD Mandate) was published. December 16th, 2015 to December 18th, 2017 marked the two year pre-compliance phase, in which all commercial vehicles were required to become equipped with AOBRDs or ELDs. December 18th, 2017 to April 1st, 2018 was a soft roll out period for the adoption of ELDs. This period gave drivers and carriers time to gradually adjust to using ELDs, and allowed the FMCSA to ensure ELD providers understood all requirements. April 1st, 2018 marks the date of the full roll out of the ELD mandate, meaning compliance in use of either ELDs or AOBRDs would begin to be enforced. December 18th, 2017 to December 16th, 2019 is the two year period we are currently in. During this two-year window, only ELDs can be installed in vehicles, although AOBRDs installed prior to 12/18/17 can continue to be used. By December 16th, 2019, every single device must be ELD compliant. Who needs to follow the ELD Mandate? The ELD mandate applies to carriers and drivers who are required to maintain RODS. As you can imagine, that’s the vast majority of drivers and motor carriers. Drivers who operate under short haul exceptions aren’t required to keep RODS, so they can continue to use paper time cards. Driveaway/Towaway drivers (where the vehicle itself is the commodity). What are Hours Of Service (HOS) Regulations? Hours of service regulations are a large set of rules that aim to ensure that drivers are not overworked. When drivers are not well rested, it is more likely that accidents will occur due to fatigue. The regulations are designed to protect the safety of drivers, with the added benefit of reducing potential liabilities for carriers. May drive only if 8 hours or less have passed since end of driver's last off-duty or sleeper berth period of at least 30 minutes. Driver needs to take 34 Hours off before re-setting the clock. Previous 7 days plus today. Sent within 13 days. 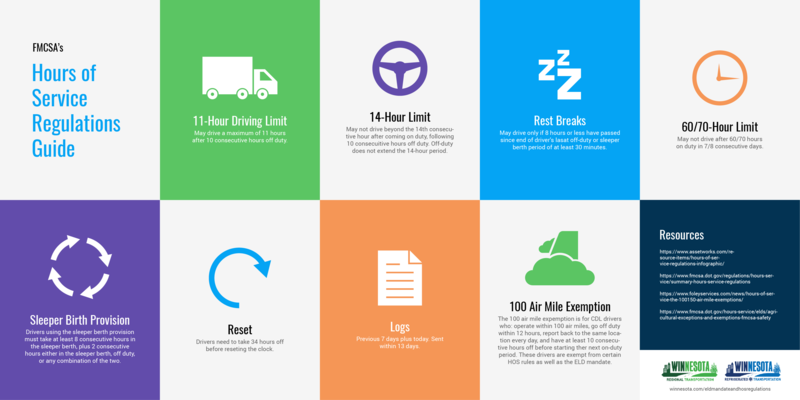 The 100 air mile exemption is for CDL drivers who: operate within 100 air miles, go off duty within 12 hours, report back to the same location every day, and have at least 10 consecutive hours off before starting their next on-duty period. These drivers are exempt from certain HOS rules as well as the ELD mandate. Drivers may not drive beyond the 14 consecutive hour after coming on duty, after their 10 consecutive hours off duty. Off-duty time does not extend this 14-hour period. This 14 hour window is often thought of as a daily limit, although it is not based on a 24-hour period. Drivers are allowed a period of 14 consecutive hours in which they can drive up to a maximum of 11 hours. This is only possible if the driver has been off-duty for at least 10 consecutive hours prior to the 14-hour window. The additional “non-working” time within the 14-hour window can be used for lunch or rest. This period begins when the driver begins any sort of work, and at the end of the period, work cannot continue until the driver has been off-duty for another 10 consecutive hour period. Drivers may only drive if 8 hours or less have passed since the end of their last off-duty or sleeper berth period of at least 30 minutes. This rule does not apply to drivers using short-haul exemptions. Drivers may not drive after 60 or 70 hours on duty in 7 or 8 consecutive days. A driver can restart a 7 or 8 consecutive day period by taking 34 or more consecutive hours off duty. In other words, if a driver has driven 60 hours in a period of 7 consecutive days, they cannot continue driving. The same applies to a driving time of 70 hours in 8 consecutive days. Drivers using the sleeper berth provision must take at least 8 consecutive hours in the sleeper berth, plus a separate 2 consecutive hours either in the sleeper berth, off duty, or in any combination of the two. Drivers are required to keep logs of the previous 7 days in addition to the current day. These logs need to be sent within 13 days of completion. While HOS regulations affect a majority of drivers, some drivers are exempt from some of the rules. Note: An air mile measures the straight-line distance from one point to another, not the actual distance traveled on a road. The 100 air mile exemption is designed for CDL drivers who operate within a range of 100 air miles, and are set to go off-duty within 12 hours. In order to qualify for the exemption, these drivers must have a set place of work that they return to daily, and have at least 10 consecutive hours before beginning their next on-duty period. All of these conditions need to be met in order for the 100 air mile exemption to be valid. The 150 air mile exemption was designed for non-CDL drivers who operate within a range of 150 air miles and do not drive through any states that require a CDL for the vehicle they are operating. These drivers must also have a set place of work that they return to daily. In order for the exemption to be valid, these drivers cannot drive after their 14th hour on duty in a period of 7 days. They also cannot drive after their 16th hour of duty within a period of two consecutive days. Which regulations are these drivers exempt from? Drivers operating under specific HOS exemptions still need to adhere to certain rules. For example, they still need to record their on-duty time—including the time they went on duty, the number of hours they were on duty, and the time they went off duty—although they are not required to maintain a detailed log of their duty status. Regardless of the requirement to log hours, these drivers are not required to follow the ELD Mandate. Drivers operating under HOS exemptions must also never surpass 11 consecutive hours of driving, and cannot drive after having been on duty for a period of 14 consecutive hours. The ELD Mandate and HOS regulations have the potential to have an extremely important role in the world of transportation, but they are equally complex. It’s important that all drivers and carriers stay on top of ELD Mandate news, and read-up on how to be compliant. At Winnesota, we constantly have an eye pointed toward innovation and the adoption of new technologies. We also strive to always have the perfect supply for your demand. If you outsource to Winnesota, you can rest assured that we will take care of ELD Mandate compliance. Don’t let the ELD Mandate scare you! It’s a logical evolution for the industry, leading to more accurate timekeeping and a more efficient process. At the end of the day, it’s a measure designed to protect drivers. Regardless, we know all these regulations can get confusing, so we want to be a resource to help you along the way. Learn about opportunities to contract with Winnesota today!